Spring Yard Zone is the third zone in the Mega Drive version of Sonic the Hedgehog. It is an urban level resembling a pinball machine, with many springs, bumpers, and secret areas. Bumpers bounce Sonic while awarding 10 points for hitting them. 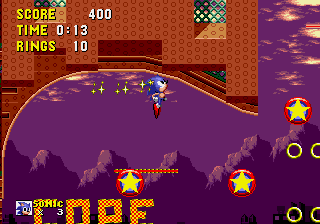 This zone's design inspired many similar stages in future Sonic games, especially Casino Night Zone from Sonic the Hedgehog 2. Spikes - Runs back and forth, only breakable from the sides. Roller - Fast-moving, found in tunnels. Bumper - Deflects Sonic without damaging him directly. Chain of spikes - Whirls around (clockwise) in an enclosed area. Large spike ball - Moves in a large circle, or in a straight line. Easy to spot and avoid. Spring Yard Zone Act 2 is the only level in Sonic the Hedgehog to feature more than one Signpost; there is a jump at the end of the level that if made successfully, will bring the player to another platform with more rings than the one below it, and the other Signpost.